There is something fantastic when tragedy leads to triumph, when grief gives way to hope. In 2005 a young girl who was a junior at my daughter's high school was killed in a car accident, her name was Anna. A story was passed on to Anna's mom about a girl who borrowed a dress for a formal from Anna. The orange dress looked fantastic on the underclassman, and Anna insisted she keep it. 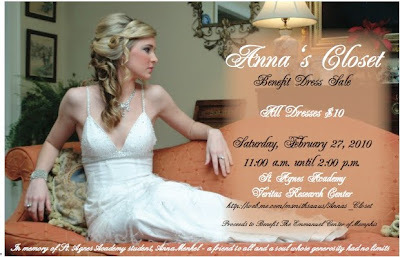 Her generous spirit lives on in a fundraiser called Anna's Closet. Throughout the year, the committee requests donations of dresses from girls at other schools, celebrities and alumni. All the dresses are sold at a one day sale for $10 each. The money raised goes to Emmanuel Center in Memphis to buy books for their after school program and the dresses that don't sell will be donated to the Center so that girls who might not be able to afford a dress for Prom can have one. What a great idea. Most Prom dresses are a wear once and done type of purchase. Teenage girls seem to think that everyone remembers what they wore last year. I can't remember what I wore last week! This year they have hundreds of dresses. For $10 each, a girl could buy a few to hold on to for the next couple of events. Some of the dresses still have price tags on them! Who does that? Buys something and never wears it? Me? Oh yea, maybe once (or twice). Even a former Miss Georgia donated a few dresses. Can you imagine buying a pageant dress for $10? So naturally, in the planning meetings for this fundraiser, someone mentions they need cookies and before you can say "Boo!" someone I gave birth to said "My mom will bake the cookies". I love that kid. She sends me a text on Monday that says" I need 200 cookies for Saturday". Of course I said "No problem". Then she says "Could you make them cute like dresses, shoes, purses?" So that is what I have been up to for the last 3 days! 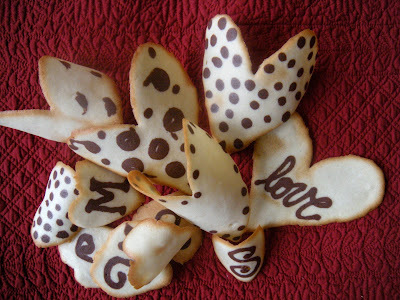 I am a little short, only about 185 cookies, but they are so much fun to decorate. If time weren't such a factor, they would be full of little details, clasps on the purses, multiple colors on the shoes, maybe some leopard print heels. I also usually have a little more time to fulfill an order. But we do have cookies. Hearts to remind us of the friendships that are forged in high school. Shoes because they can cost as much as the dress, and are usually taken off as soon as the pictures are taken! Purses because they carry all the important things. Digital camera so you can get the pictures on Facebook by breakfast, lip gloss, cell phone in case things take a turn for the worse you can text your girlfriends, and cash. I once took a taxi home from a formal dance. You just never know. And of course orange gowns. Because that's what Anna left behind. When I really put pen to paper, it is obvious we eat a lot of vegetarian meals. And, truth be told, I don't miss meat, although I could never give up that occasional ribeye on the grill. When I was in Florida visiting my parents, an old high school friend and her husband came for dinner. I knew she wasn't a meat eater, but she's a good Italian girl (like me) so I decided on spinach lasagna. It worked out great because my mom has vegetarian friends and she is always pondering what to cook for them that is still satisfying for the meat-eating, hunter/fisherman dad of mine. So I made two pans and put one in the freezer for her. Here we are a month later and in the Lenten season. As a Catholic we don't eat meat on Ash Wednesday or any Friday during Lent. All over town the Friday Night Fish Fry will be on, but this spinach lasagna is a lot healthier and frankly, way more delicious. Of course you could add some crumbled turkey or chicken Italian sausage and it would satisfy any meat eater! This is the first time I have used to no boil lasagna noodles, and I thought they were so easy and delicious. We don't eat lasagna more than one or two times a year, but I will definitely use these short cut noodles. I usually buy my marinara sauce (okay, so maybe I am not that good of an Italian girl). Fresh Market carries a marinara in a carton that I love. No corn syrup, not loaded with preservatives. I have used both skim and whole milk ricotta. The whole milk tastes better and interestingly enough, the nutrition label on both were identical. Not sure how or why, but because we only eat it a few times a year, I am going with the flavor of whole milk. I have made this 2 ways. One time with the spinach separate as its own layer, and the best version which follows, with the spinach and ricotta mixed. In a 9X13, dribble a little marinara on the bottom and smear it around. Lay out a layer of noodles. Dribble a little more marinara. In a bowl mix the ricotta and spinach and add seasonings. I use garlic salt with parsley, fresh parsley, and Italian herbs. Layer half of the ricotta mixture on noodles. Next layer is sliced zucchini. Scatter about 4 sliced sun dried tomatoes. A little Marinara and another layer of noodles. Then the rest of the spinach and ricotta, zucchini and a little marinara. Last layer of noodles, marinara and mozzarella to seal it all in. Top with a few slices of sun dried tomatoes. You can freeze it at this point, well covered. Otherwise preheat oven to 375°. I poke toothpicks around the edge of the lasagna and tent with foil. If the foil touches the mozzarella it will take it all off when you uncover it. I bake it for about 20 minutes and then uncover for another 20 minutes. When it is all bubbly, it's done. Allow it to rest for about 15 minutes so it slices clean. Buno Appetito! 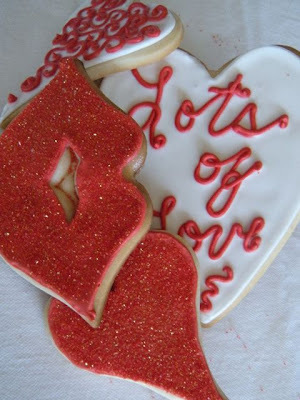 My sugar cookie obsession is heightened at Valentine's Day. I love the simple palette of reds and pinks, the sparkles, and of course the hearts. The travel schedule for February put a dent in my baking plans, but I did get a few cookies out, and had to throw them on the blog as a mini tribute to my Sweeties out there. I made personalized hearts for the volleyball team. 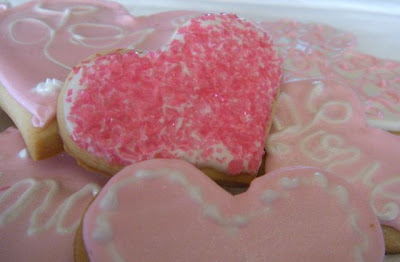 Pink frosted hearts with edible glitter and packaged with a tulle bow. I mean seriously, who doesn't love personalized, sparkly and edible? I also packaged up a few cookies for my USAFA Doolie who is going through "hell month", some sweet messages to my mother-in-law who is freezing in this crazy weather up North, and a Valentine's thank you to my mom and dad since I had such a great trip last month. It was also an old friend's birthday so I sent her a few cookies to Minnesota. Hopefully they won't shatter in the frigid temps! Some people are a little surprised by the crispy cookie and hard frosting. This is exactly the way I like them. There was a pan this time however, that hung out in the oven a tad too long, so crispy may be an understatement. 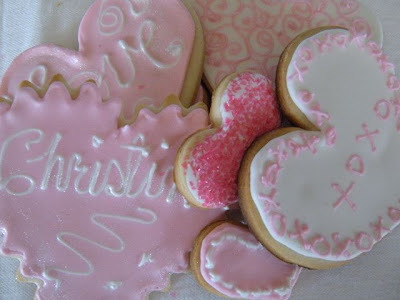 But I love the contrast of that butter cookie with the royal icing. I am often asked about the royal icing. I do not use raw egg whites in mine, but I do use Wilton's Meringue Powder. I wish I could say it was an exact measurement, but I just sort of dump some in the mixing bowl, add a little warm water and a small amount of powdered sugar. I whip it for about 7 minutes until it is gorgeous and fluffy. If the cookies are being mailed out, I add a little corn syrup, otherwise just some clear vanilla and about 2# of powdered sugar and warm water to get the consistency. I made a few extras for my own special Valentine as I am gone this weekend. Lucky guy, he can finish that awesome birthday cake too! I also thought it would be fun to see what I was blogging a year ago. The Miracle WHip Facial is one of my most popular hits on my blog, but the Daring Baker's Challenge for January was one of my best Valentine creations! I hope you all have a lovely Valentine's (read: over hyped, commercialized, and over rated) Day. There was a time when this day was full of expectation, excitement, even disappointment. It is much more fun giving my home made Valentine's to special people and making their day since I already have my Valentine. Super Bowl Sunday, and we get in the car in Nashville just about the the time Carrie Underwood starts the National Anthem and pull in the driveway hours later as the confetti is flying and awards are presented. A long volleyball weekend was over, and I had a lot of things planned for Monday morning. Scott turns 50, what a milestone. I had a hair appointment scheduled, then a little shopping, groceries and home to bake a cake. We were going to go out to dinner since Christina had practice and do family dinner (sans Nic) on Tuesday. Mother Nature had a different plan. I just couldn't get back to sleep this morning, so I got up to make my list for groceries, pull out the recipes, unpack, that sort of stuff. Then I looked outside. SNOW! Lots of it. And still snowing, the snow was gorgeous, fat flakes. I checked the school updates, cancelled, that was good as Christina is feeling poorly. I checked the baking supplies, damn. It is so hard to make a home made cake without butter. Me, out of butter, now that is surprising. So I went and woke up the birthday boy. 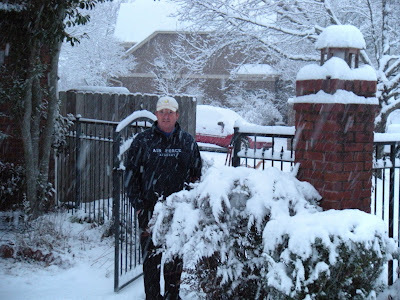 I told him he could thank me later for the lovely snow I arranged for him, but right now I needed him up and at 'em to get me to the supermarket or he wasn't getting cake! 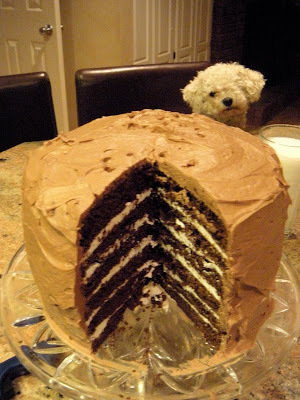 Chocolate cake, with buttercream icing, made by "moi" is a great motivator because we were off in minutes! We came home to sausage and waffles for breakfast and I searched for a cake recipe. Why not try something new I thought, I had all day. 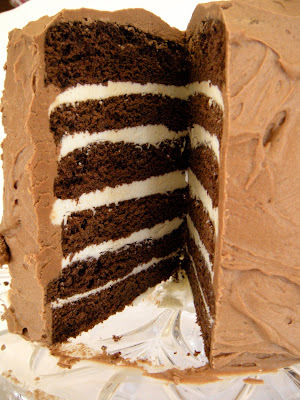 I decided on a Mile High Chocolate Cake with Vanilla Buttercream and Chocolate Ganache that I found on Epicurious.com. Well, sort of decided anyways. I have admitted numerous times that I am no good at following directions, and I took a perfectly good recipe, at least according to the reviews, and changed it. So as the day wound down, the snow turned to rain and the beautiful birthday snowfall fell in clumps from the trees. The roads look better, but who knows what the temperature will do tonight. Drop and bring us more snow? Sleet? Doesn't matter. We are having meaty, mushroomy spaghetti (birthday request), fresh baked bread, salad and Mile High Chocolate Cake with Vanilla and Chocolate Buttercream.